James Wilson has been on top form this season so far. Alex Iwobi’s early goal was not enough for Arsenal U18s to overcome Manchester United U18s in this morning’s Barclays U18 Premier League clash. Ashley Fletcher and James Wilson were on hand to give the visitors all three points to put United top of the table, albeit with a game more played than everyone else. Dan Crowley was Arsenal’s brightest player in the first half of the game although it was United who threatened first as Fletcher hit the post after just two minutes. Callum Evans brought down Chuba Akpom after 15 minutes, which saw the referee indicate for a penalty. Akpom stepped up but couldn’t find the net. However, the rebounded shot fell to the feet of Iwobi who made no mistake in following up and putting Arsenal ahead. Just after the half hour mark, United were back in the game when Wilson ran through on goal and unselfishly squared the ball for Fletcher, who made no mistake in netting the equaliser. After the half-time break, the away side came out all guns blazing and Wilson put them ahead. He beat four players before slotting past a helpless Gunners goalkeeper. Jack Jebb had Arsenal’s best effort to get back in the game but he couldn’t direct his 25-yard drive on target to leave Manchester United heading back up north with all three points this afternoon. hmm,,, we are Man Utd, even the senior side can implicate the same agony to the senior gunners, we are great beating arsenal . GGMU. 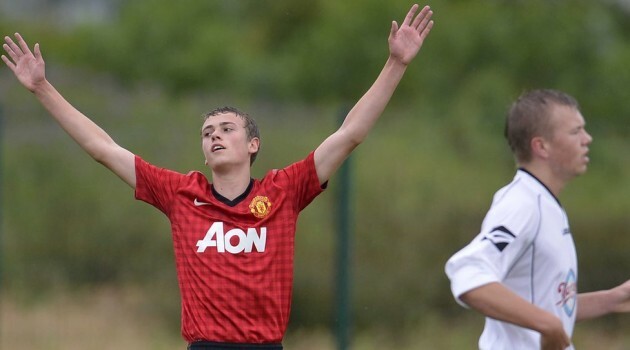 of the post:”Barclays U18 Premier League: Manchester United Edge Out Arsenal “? ?